Purity: 99% (HPLC). CJC-1295 is NOW sold in 5mg.. 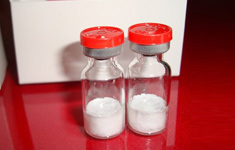 Kit of 10 amples 2mg each CJC-1295 has shown some amazing results as a growth hormone releasing hormone (GHRH) analog. Not only has CJC-1295 shown potential to increase growth hormone and IGF-I secretion and effects, but it has been able to do so in very large amounts. CJC - 1295 Stimulates GH and IGF-1 Secretion, and will keep a steady increase of HGH and IGF-1 with no increase in prolactin, leading to intense fat loss, and increases protein synthesis for more muscle growth.